Harv thinks this is a nice alternative to his usual monogram. I got some great gifts this Christmas -- a bronze purse, horse videos, an Ariat shirt, a vintage show jumping poster, and more. File under "give this next year!" One fun and practical gift really stood out this year. 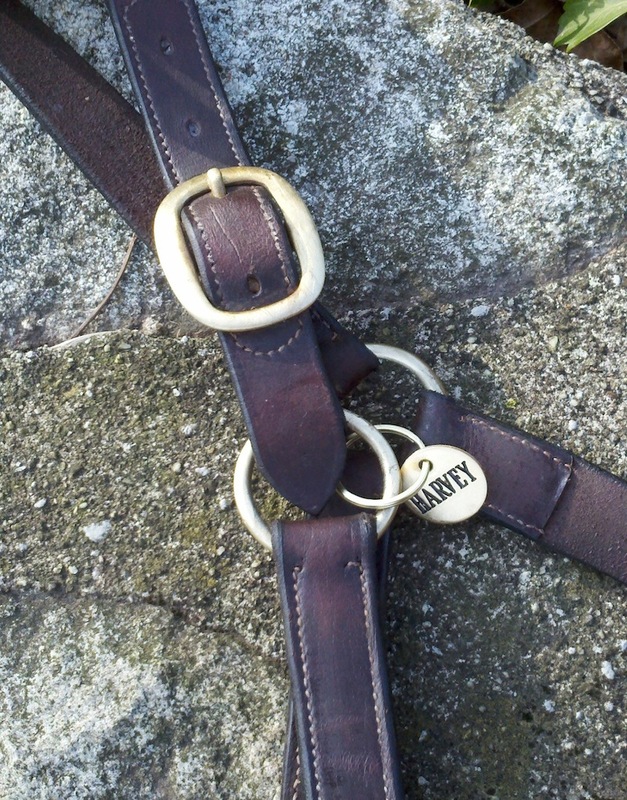 Struggling to buy for your horse-loving friend? Think halter tags! I now have one for Ri, one for Harv, and to make a "larger" gift give more so that your recipient can use them to tag blankets too. Add a cell phone number on the back, and folks will be able to identify you as the owner! Thanks to the person who thought to give me these. Harv likes his -- he thinks it makes him look distinguished. 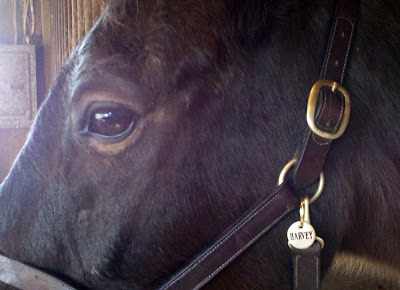 I think the looks especially nice on his coincidentally new halter. Riley has a show halter with orange piping and his tag is on that one, not his muddy pasture halter. Wow-I'm thrilled you like them so much! I had ordered a bunch last year for my barn buddies and they were a hit, so I got them for new boarders at the barn this year. I have them all all of Moxy's blankets as well as on her halter. I got them from haltertags.com, and I've been pleased with how well they hold up to abuse: much better than the "engraved while you wait" kind of tags. Very nice, and very stylish. My Boys do not wear halters except when being handled, but it would be a great idea in a boarding barn where you'd also want your halter identified. Nice too in that you could switch it from halter to halter over time--unlike the crewed on nameplates. I ordered these for my guy's special barn buddies this year. Tied to a big candy cane, they make lovely, useful gifts- please consider reposting in early December to remind us! A great idea for boarders, yes, and also if you keep your horse at home but attend shows and share the trainer's tack room. Huey's brown leather halter has a plate, but his black one needs "something"--and tagging bridles is another use for these very handy disks.